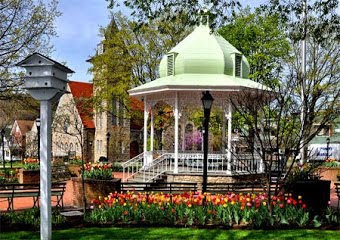 Ligonier Living: Raving about Ruthie's! My husband and I have haunted the antique and collectible treasure troves of the Ligonier area off and on for years. After an "off" period, we returned to Ligonier (one of our very favorite areas) to browse and shop, browse and shop and shop, shop shop! All that browsing and shopping of course eventually makes a body hungry and we love finding new and off-beat places to replenish our energies. Okay, I confess: I have a "thing" for diners. Especially when we are in a new area and/or see a new (or very old) diner ~ well, no matter what the outside of the building looks like: if the parking lot is jam-packed the first time you drive past (and still jam-packed the second and third time you drive past), and especially if it is jam-packed in the "off" times between lunch and dinner (or between breakfast and lunch): it just may be that "something" is drawing all those people in there. And that "something" is usually great home-cooking at a more than reasonable price. Ruthie's Diner is one of those places. Definitely one of the "crown jewels" of my never-ending great diner quest. And to my husband's great relief, even the outside is presentable (grins). Not that we don't dine in a range of places, from whatza-star to four star, but diners, Virginia, are just plain FUN! (and filling as well, if you know how to pick 'em). The first time we walked into Ruthie's there were people packed in there from every walk of life, clad in everything from overalls to expensive business suits (another good sign). The next "lesson" of diner dining is to check the "specials" and Ruthie's had two spaghetti dinners on special that day for $7. No, not $7 each! 7-bucks for BOTH of them. Who in their right mind wouldn't want to try something like that, especially seeing as how all the other customers looked so happy and satisfied? The first question to the more than efficient waitress (and you can expect efficient service consistently) was, "do we get meatballs with those?' Yes, one each, but we could order more meatballs for 50-cents each. Splurge Time! Two extras on each plate ~ well, make that Small Platter, because that is exactly what the spaghetti was served on (what every meal we have had there since then have been served on, as a matter of fact) ~ with a side salad and bread and butter. And the meatballs were Huge. And Delicious! There is just no superlative out there that would do them justice. Needless to say, our puppies are always happy when we eat at Ruthie's because there is always a Very Big Doggie Bag for them when we get home. Someday, maybe I will put together a guide on the art of picking good diners (and believe me, no matter how they look on the outside, I can pick 'em and my dear once-very-leery husband has become a big believer! grin) But in the meantime you can take it from a true Diner Diva, Ruthie's is absolutely, indubitably and positively conclusively one of the best out there. ANYWHERE! Contributed by: the Colonel and the Mrs.
Much thanks to the Colonel and the Mrs. for contributing to Ligonier Living. 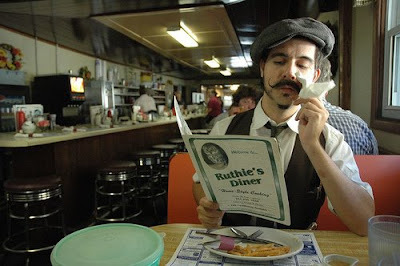 I have to say I love diners, too, and Ruthie's is a local favorite. If you've not been to Ruthie's Diner, it's on Route 30 just outside of town, on the way to Ligonier Beach. OH MY yes yes yes on the spaghetti dinners!!! You can't beat them! I adore it and you have enough for almost 2 meals at least for me. The sauce is yummy and even the balls. I like the garlic bread too. Oh man now I'm hungry for it. tee hee. Great write up and thanks again for contributing so positively and finding a hollow spot that needed filled in. I think that will make anyone/everyone want to visit our lil treasure.